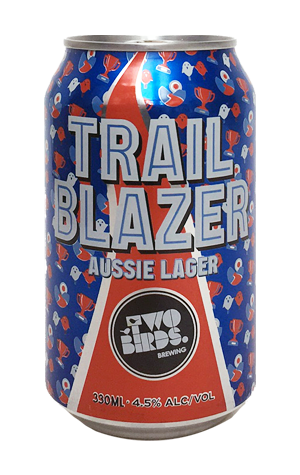 Trail Blazer is the beer created by Two Birds Brewing in conjunction with the Western Bulldogs AFL Women's team for the 2018 season – a season that's taking the trailblazing, collaborating women all the way to the footy finals. Initially, the beer was available at the Whitten Oval but, as the season moves towards its close, the cans are heading further afield. You can read about the beer's genesis here or simply go out and grab one of the red, blue and white cans, designed to reflect both the AFLW team and the Birds of Spotswood, for yourself. If you do, you'll come across the brewery's spin on an Aussie lager: a deep golden pour, reasonably weighty on the malt front, with a hint of fruitiness and, despite its very 2018 origins, not a million miles from the beers you've found at the footy for years.